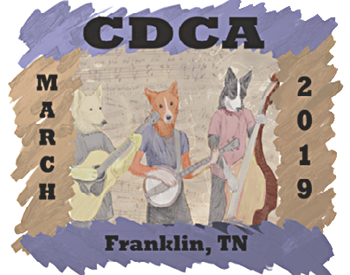 In conjunction with Country Music Cluster All Breed Dog Shows, sponsored by Nashville Kennel Club and Tullahoma Kennel Club of Tennessee, Friday & Saturday, March 8 & 9, 2019. Pet Agrees will be offering collections (blood draws) for the CHIC DNA repository for Canaan Dogs all days. Please consider donating samples, which can help researchers determine research projects and testing aimed at reducing the incidence of inherited disease in dogs. For more information, visit https://www.ofa.org/about/dna-repository. Order your 2019 Specialty gear today! Order your 2019 Specialty gear from GearBubble. Your purchases support CDCA Ways & Means. $144 per night, no pet fee - Deadline for Group Rate 2/8/19. When making reservations for the 2019 CDCA National in March, if you would like a room with two double beds, vs a king, ask for Kimberly at ext. 5105 and she can make it happen (the reservation folks can only make king bed reservations). The Country Music Cluster usually offers an exhibitor appreciation dinner one evening, has health clinics and often has repro services available. RV parking available. Unfortunately no obedience/rally offered with this cluster. Deadline for holding Herding Tests. Unfortunately, there was not enough interest by this date, so Herding Instinct Testing has been cancelled. Deadline for Banquet Reservations. Please complete and submit this Banquet Reservation form. Judges Ringside Mentoring during Specialty, Hands-On Workshop 30 minutes after completion of Specialty. Potential for Ringside Mentoring at the Designated Specialty on Saturday, March 9, 2019 at the Tullahoma Kennel Club of Tennessee and/or the Supported Entries (Friday, March 8th and Sunday, March 10th) (all at same location) BY PRIOR ARRANGEMENT WITH AMANDA.